Christmas at the Chua household was always a little different from other North American families. For one, it was never a big holiday (Chinese New Year’s was much bigger) and another, our food was a tad different. Once in awhile, my mother would opt for curry or duck instead of turkey and goose. One mainstay of the holidays was her Pineapple Tarts. The special part was that they were made with real pineapples, which she would make a kind of jam with in order to fill the tart shells. Leftover filling could be used for toast. Here’s my mother’s time-worn recipe with its traditional measurements. 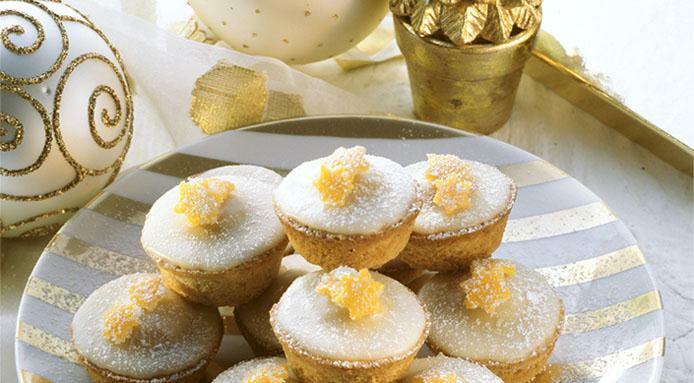 Be sure to have the tarts for breakfast, they are a sweet Christmas treat. If you're into more Yuletide yummies, check out Mary Luz Mejia's piece on Christmas cookies, Katrien Vander Straeten's Saint Nicholas speculaas cookies and lastly, Carrie Grovesnor's savoury holiday cheesecake. Rub in butter and then vanilla. Mix in yolks and food colouring and salt. Add the boiling water and combine into a dough. Cover the dough with a damp cloth. Rest in the refrigerator 30 minutes. Remove peel and the pineapple’s “eyes”, pour out the juice. Cut up the fruit coarsely. Cook the pineapples, cloves, cinnamon, salt and anise over medium heat. Add sugar and stir constantly until the mixture is thick. This can take up to 90 minutes. Cool or store overnight for use later. Roll out the dough and use a tart mold to make the shape. Fill the mold with the pineapple filling. Pinch a fluted edge around tart. Cut up the candied cherries into quarters and push into filling. Bake the tarts on greased trays for 20 to 25 minutes until light brown. Cool before eating or storing in air-tight containers.